A Wheaten terrier wants to chase anything that runs. 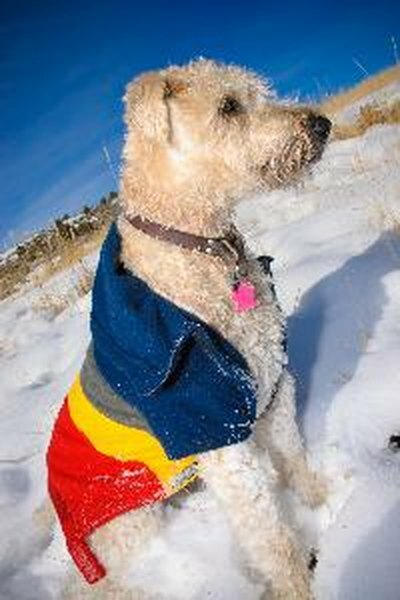 The Soft Coated Wheaten Terrier is prized for its soft, silky, wheat-colored coat. Self-confident and alert, this medium-sized dog has been known for more than 200 years in Ireland as a versatile farm dog, controlling vermin, herding sheep and hunting otters and badgers. Wheatens are terriers after all, and have many of the behaviors that are associated with terriers. Feisty and energetic with a high prey drive, they are clever at escaping fences and yards to chase anything that runs. Terriers are intelligent dogs and can be stubborn and independent, so early and consistent training is crucial to keep these traits in check. Some terriers, including the Wheaten, are quick to bark and so make excellent watch dogs. Wheatens are well-known for bouncing and jumping. They can leap straight up in the air and will jump on people to get attention or just to show their high spirits. Referred to as the "Wheaten greetin'," this behavior can become problematic and difficult to control. To keep it in check, train your Wheaten basic commands, place him in a sit-stay position when he greets you and reward him with his favorite treat. The Wheaten is a playful and happy dog and retains a puppy attitude throughout his life. For instance, though he barks to announce strangers, once he announces them, he is likely to welcome them as friends with bouncing and exuberant affection. Wheatens are not as aggressive as some terriers, and often get along better with other pets. Because the Wheaten is a very sociable dog, he needs a lot of companionship. If left alone daily for too long, he is at risk for developing separation anxiety. Destructive chewing and excessive barking can result. If you're gone a lot during the day, this is probably not the breed for you. The intelligent Wheaten also needs mental stimulation. Provide active toys and games, such as food cubes and fetch, to satisfy his need for exercise and mental stimulation.